When it comes to online shopping the first thing that comes to your customers mind is: “When will my shipment arrive with UPS, FedEx etc?” There is nothing more frustrating for customers when they can’t easily find a tracking number in the order confirmation and the package will be delivered when they aren’t at home. Having to pick it up and standing in the waiting line at the post office after work. Man, that is time consuming and annoying! 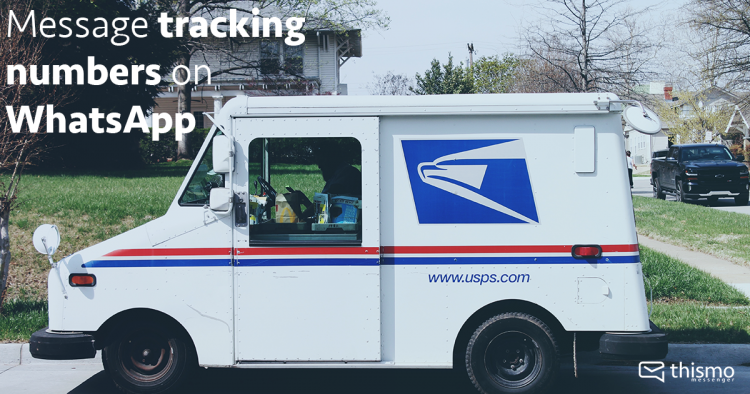 Wouldn’t it be easier for your customers to get a message about the tracking of the package two days before delivery and to be able to choose date and time of arrival? All of this within a automated conversation? I think the postman, their neighbors and also your customer would be happy if a shipment could easily get delivered directly to every recipient. 😀 So, why can’t your customers track their package with messaging services like WhatsApp? Lesson: Give your customers always the opportunity to see all the information of their order in detail and let them easily get information about the current state of the delivery. With messaging everything gets more simple, let us show you how! Your customers place an order on your website, entering their name and email or phone number. With that, you are able to send the order confirmation and the tracking code to your customer via message. If they haven’t downloaded the thismo messenger customer app they will receive the message as an email or SMS/text message. But there is more than that. If a customer has any further request about the delivery and send’s a message back, you can simply continue the conversation. All the information like the order and tracking number and the customer name, is available in the chat context. So, you can answer right away. And of course, you can connect thismo to your own shipment system to automate common answers to requests about the current shipment status. Further, messaging makes its easy to get in touch with customers again and tell them about your great new offers. You got a direct line to your customers phone: the customer’s chosen messaging service – what do you need more for your remarketing campaign with thismo messenger? You want to message with your customers? Great! But we tell you why you should not use only a single messenger channel like WhatsApp for customer communication!